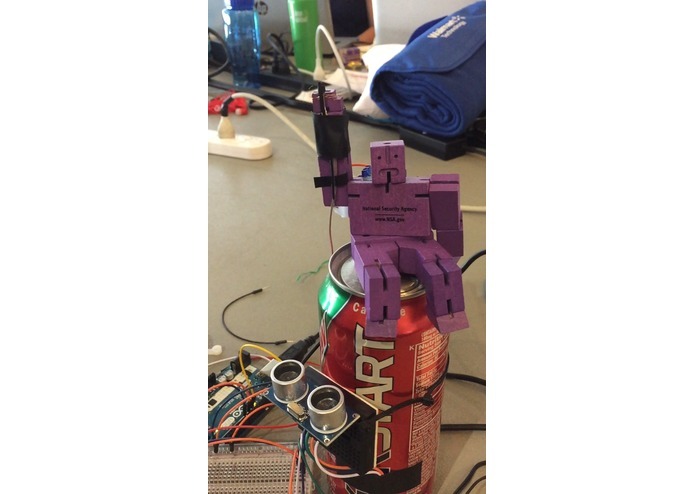 A small robot that high fives, waves and replies to your tweets! A simple robot that makes your day just a little better. I took one the small wooden robots that I got at the beginning of the hack from one of the sponsors and attached servo to move the arm, an ultrasonic rangefinder to see when you want a high five, I made a small tactile switch to sense high fives, and I used the twitter api to have it reply to tweets on occasion. I didn't have too many supplies to work with so I had to improvise witw the mechanics of the arm. I am many a hardware dev so implemeting twitter was a challege given my limted CS background. that I actually got him to reply to tweets, definitely the hardest for me. I found a very useful twitter library for processing that let me really work wtith an api for the first time. Hi 10s, Hi 20s, the sky's the limit for this little robot!